This is specially designed veterinary pet stretcher for clinics, shelters and pet transportation (taxi) services. Design allows easy handling in small spaces such as X-ray rooms (RTG), passenger cars, stairs and elevators. This animal stretcher is very light and specially shaped to allow easy and safe transportation of medium and large dogs. Ergonomic shape eases load on the lower back, which is very important for people who need to use the stretcher more often. 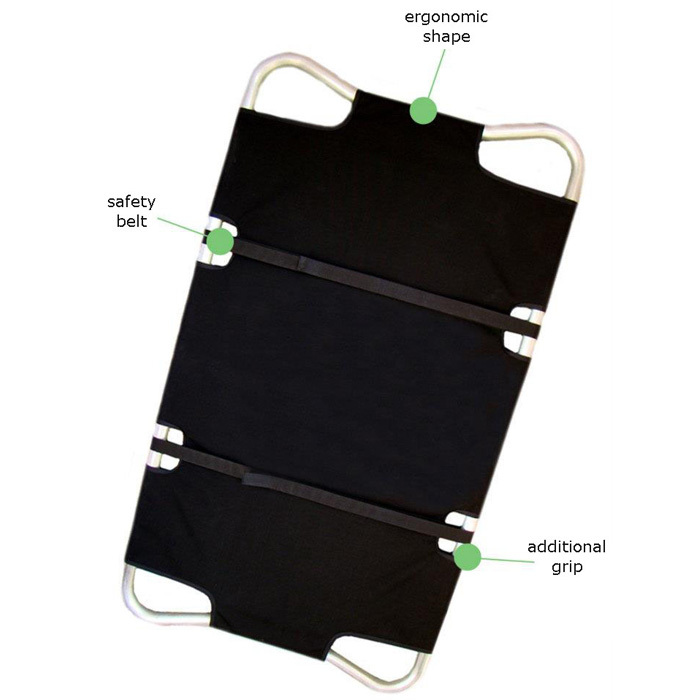 Eight grips allow to handle stretcher from all four sides. Grips can be used for pulling seat belt buckles and securing stability during driving in most of the cars. This is very helpful for handling stretcher in X-ray rooms, stairs, cars, small or curved spaces. Two independent belts can also be used over the shoulders for easier carrying on longer walks. All materials on stretcher are stainless and long lasting. Anticipated duration for construction is +20 years. If needed, cover can be ordered separately. Also cover can be removed and washed when needed. Material is water-resistant and waterproof. That allows to simply wipe cover with any disinfectant cleaner after every use. Bloodstains are not visible because of black color. Two independent belts can be adjusted to accommodate different sized dogs. Also they can be used as extra handles on the dog stretcher. Who uses Pet transport veterinary stretcher? Croatia, Zagreb – DODO-VET d.o.o. Croatia, Zaprešić – VETERINARSKA STANICA d.o.o.